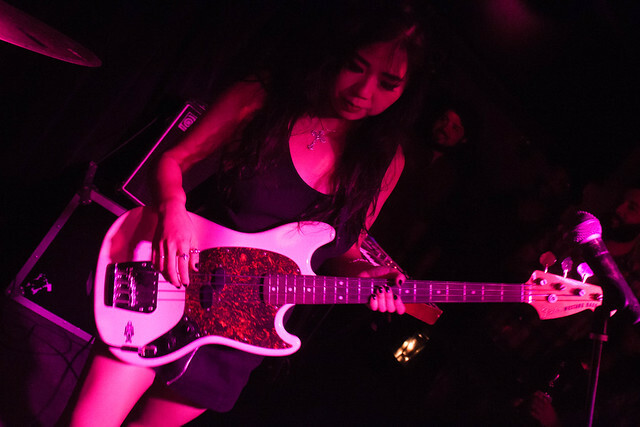 Over the past couple of years, I’ve written a bit about the Los Angeles, CA-based indie rock/garage rock trio L.A. Witch, comprised of Sade Sanchez (lead vocals, guitar), Irita Pai (bass, backing vocals) and Ellie English (drums). And as you may recall, the trio have developed a reputation for crafting a grungy, garage rock sound that draws from late 50s-early 60s rock, The Pleasure Seekers, The Sonics, The Black Angels, The Brian Jonestown Massacre and others — all while bearing a resemblance to JOVM mainstay artists The Coathangers, Sharkmuffin and Death Valley Girls. The band’s self-titled, full-length debut was released last year through Suicide Squeeze Records, the label home of The Coathangers and others, and the album’s first single “Drive Your Car,” (which was also released as a 7 inch single back in 2016), is a grungy and gritty track featuring a propulsive rhythm section, chugging power chords fed through reverb and delay pedal paired with Sanchez’s sneering vocals — and while clearly resembling The Coathangers, the song manages to possess a malicious and murderous intent, along with some roaring hooks. Directed and edited by Allie Lane, the incredibly cinematic video features a collection of badass ladies, including the members of L.A. Witch driving sweet cars through the desert, cut with footage of the band playing the song. Certainly, if you’re a photographer, you envy how rich the blues, browns and blacks came out under seemingly endless skies. Comprised of founding members Erin Jenkins and Mathieu Blanchard and recent recruits Chris Dadge (bass), who has had stints in Lab Coast, Alvvays and Chad VanGaalen‘s backing band; and renowned singer/songwriter and guitarist Samantha Savage Smith joining a guitarist, Canadian band Crystal Eyes can trace their origins to the melancholic dream pop the duo wrote while nomadically bouncing back and forth between Tofino, British Columbia and Halifax, Nova Scotia — dream pop that the band’s founding duo has claimed has drawn from Francoise Hardy, Guided by Voices. As a relatively constituted quartet, the band has continued to tour across their native Canada, including consecutive appearances at Pop Montreal. The band’s latest effort The Female Imagination was written while the band spent time on a lake island in rural Ontario and was recorded on a Tascam 388. And according to the band, the album thematically focuses on and explores the other side of ourselves that we can never quite seem tor reach. The album’s latest single “Already Gone” consists dreamy and ethereal harmonies with layers of shimmering guitars played through copious amounts of reverb and delay pedal and a persistent, driving rhythm and in some way, the song sounds as though it were equally influenced by 60s garage psych — i.e., much like contemporary acts like Raccoon Fighter, The Black Angels, early Dum Dum Girls, Death Valley Girls and countless others but with a moody and sensual feel. “Disco,” the latest single off Glow In The Dark is a jangling and propulsive bit of psych rock, complete with droning organs that sounds as though it were indebted to The Jesus and Mary Chain but with a sneering, punk rock air — and a badass, in your face, self assuredness. Interestingly, the recently released music video was directed by Kansas Bowling, who recently directed BC Butcher, the latest release from proprietors of all things low budget gore and horror, Troma Films. As a result, the video is a proper send off to all things go-go but with a Satanic murderess, who kills people with records. Comprised of founding members Bonnie Bloomgarden (lead vocals) and Larry Schemel (guitar), along with Nicole Smith (bass) and Laura Kelsey (drums), Los Angeles, CA-based quartet of Death Valley Girls have deliberately shrouded themselves in mystery. Besides the fact that they’re incredibly photogenic, very little is known about them, except that their aesthetic is deeply influenced by old-school B movies and biker movies — in fact, at one point, the members of the band had developed a reputation for appearing at gigs wearing all leather and parking their beaten up bikes in old-school biker club formations. Now, over the years I’ve written about the band on a number of occasions — including “Gettin’ Hard,” a single that sonically owes a debt to The Stooges, The Troggs, The Ramones and contemporary acts including Lantern, while “Summertime” had the band taking up shimmering reverb-filled garage psych rock. “I’m A Man, Too” off the Southern California-based quartet’s soon-to-be-released effort Glow In The Dark will further cement their reputation for crafting old-school-leaning rock — but in this case, in a bratty song that indirectly channels Cyndi Lauper‘s “Girls Just Wanna Have Fun,” The Go-Gos, The B52s, Nancy Sinatra and others after a night of vodka, gin and cigarettes as a bratty and infectious hook and chorus are paired with simple and propulsive percussion and loose and bluesy guitar chords while revealing an in your face self-assuredness.